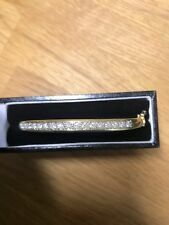 Ladies Genuine Diamond Pave DESIGNER Bangle Bracelet in 10k White Gold 3ct 7"
Ladies Genuine Diamond Pave DESIGNER Bangle Bracelet in 10k Yellow Gold 3ct 7"
14ct Yellow Gold 585. 14ctYellow Gold Bangle set with Diamonds. Wide Fit Bangle. Bangle weight 8 grams. Hallmark stamp located inside Bangle band. Bangle has been Hallmarked at the London Assay Office. Hallmark : 9ct London 1999. Plain polished in finish. DIAMOND SET TORQUE BANGLE. Colour : H-J. Shape & cut : Round modern brilliant. Diamond weight : 0.75ct est. A beautiful piece. Sponsors Mark : AG. 16 DIAMONDS - 0.12 CTW, ROUND, BLACK, OPAQUE. 31 DIAMONDS - 0.15 CTW, ROUND, COLOUR H-I ( WESSELTON, WHITE TO SLIGHTLY TINTED WHITE ), CLARITY I1-I2 ( VISIBLE NATURAL CHARACTERISTICS ). Round White Diamond Bangle Link Bracelet. This bangle bracelet will fit upto 9" wrist and is9mm wide. Clasp Type: Foldover. This particular bracelet features a white diamonds in a prong setting set in stainless steel. 9ct white ROUND gold bangle. -ROUND heavy solid 23.90 grams. -sent in box. -we can provide WGI certificate upon request. -depth 4.40mm. Silver real diamond set ladies bangle. Diamond Shape: Baguette. This particular bangle features a unique design with round diamonds. The diamonds are set where the diamonds are getting the largest amount of shine. Style: Bangle. Fancy Diamond Color: White. This hamsa / khamsa jewelry is a new trendy piece we have added to our collections of diamond jewelry. The hand is a universal symbol for protection from the evil in this world. This bracelet holds the center piece together. Jewelry For Less designers bring to you this beautiful bangle. This beautiful round cut diamond bracelet is set in 14K Yellow Gold. The diamonds are securely held between the gold mounting in flower prong setting. Style: Bangle. New to our JFL collection is this popular round diamondBangle Bracelet. These are all 100% genuine full cut round diamonds held between the gold mounting in a prong setting, making the overall appearance larger and lustrous. LADIES 14K YELLOW GOLD 1.31CT OVAL CUT DIAMOND SOLITAIRE OVAL BANGLE BRACELET 7"
STONE SHAPE : OVAL SHAPE. HALLMARKED : 14k. CENTER STONE : DIAMOND. Style Bangle. CENTER COLOR : I,J. Fancy Diamond Color Gold. CENTER CARAT : 1.31CT. CENTER CLARITY : I1,I2. The diamond is bezel set in solid 14k white gold. Bracelet Type: Bangle. Style Bangle. Clasp Type Bangle Bracelet. 6 0.043 Ct -- 2.2 MM, I1/H Round Diamond. Bracelet Width: 2.5 mm. Bracelet Inner Circumference: 8 In. LADIES. 925 STERLING SILVER 0.19 CT. PAVE DIAMOND BRACELET BANGLE. Style: Bangle. Diamond Setting: Pave. This particular bangle features a unique design with round diamonds. This bangle can fit up to a 7" wrist and is 4mm wide. A thoughtful look just for her, this gorgeous diamond bracelet is a winner all around. Crafted in 14K White Gold, this stunning style features 3 round diamonds each with a color ranking of H-I and a clarity of I1. Here is a Fine 18Kt Cheetah Diamond Bangle. Made from Solid 18KT White Gold and weighs 108.7 grams. It holds 117 Natural Gray Diamonds that add to 10.00Ct I1 Clarity, and 7.37Ct of Natural Round Brilliant Diamonds that are I1 Clarity H Color. Inside the heart features (15) single cut diamonds in a pave setting. The bracelet has been chemically oxidized to have an antiqued finishing touch. Type of Jewelry: Bracelet Gemstones: Diamond Approx. Diamond Setting: Fanook. Cast in real. 925 Sterling Silver. All Round cut diamonds are set in Fanook setting close together to give an amazing shine. Style: Ladies Diamond Bangle. Diamond Shape: Round. Rich in brilliance, this diamond bangle 6.5" bracelet showcases more than 104 petite round diamonds set in 14k white gold for a total carat weight of 1/2 carats. Style Bangle. Clasp Type Bangle Bracelet. This eye-catching diamond bangle bracelet is crafted in solid 14K white gold. An exceptional design, this bracelet is polished to a bright shine. Securely locking with a durable hinged lock with safety fold-over latch. 2 0.010 Ct -- 1.3 MM, I1/H Round Diamond. Bracelet Width: 4 mm. Bracelet Inner Circumference: 7 In. 2 0.035 Ct -- 2 MM, I1/H Round Diamond. 2 0.080 Ct -- 2.8 MM, I1/H Round Diamond. Diamond CTW: 1/5. Diamond Bangle Bracelets. Huggie & Hoop. Five diamonds line this thin eternity bangle, crafted in 14-karat white gold with a slip-on design. Clasp Type Bangle Bracelet. Diamond Earrings. Diamond Studs. This particular bangle features a unique design with diamonds. This bangle can fit up to a 7" wrist and is 5.75mm wide. Style: Bangle. Diamond Setting: Pave (prong). Diamond Shape: Round. When the manufacture makes errors, it can lead to a defect in the item stone setting. Style: Bangle. The bangle is 4mm wide. This particular bangle features a unique design with round diamonds. Width: 4mm. Diamond Shape: Round. When the manufacture makes errors, it can lead to a defect in the item stone setting. A new sophisticated and elegant look. This bracelet would make a great addition to her jewelry collection. All the diamonds on this bracelet are of equivalent color and clarity, giving this bracelet a comparable shine and luster throughout this bracelet. Style: Bangle. Diamond Setting: Pave. This particular bangle features a unique design with round diamonds. This bangle will fit up to an 6.50" wrist and is 0.85" wide. Diamond Information. Fancy Diamond Color: White. The diamond is bezel set in solid 14k yellow gold. Polished to a brilliant shine. Bracelet Type: Cuff. Style Bangle. Bracelet Width: 4.8 mm. 1 03.00 MM (02.81 - 03.10) Full Cut, I1 ROUND G-H GENUINE DIAMOND. Wonderful modern style is found in this 14Kt white gold diamond stackable bangle 7.25" bracelet featuring a total carat weight of. 75 carats. 0.028 Ct -- 1.90mm, I1 Round Diamond. Diamond carat weights (CT.) represent the approximate total weight (T.W.) of all diamonds in each setting and may vary no more than. 07 below the stated weight. This eye-catching diamond bangle bracelet is crafted in solid 14K white gold. This stunning style features 2 solitaire diamonds in the center with beautifully set row of round diamonds in a bypass design. This bangle bracelet showcases round diamonds flush set in 14k white gold.Total weight of the diamonds is 1/6cts. Total weight of the gold is 14.49 grams. 7 0.010 Ct -- 1.3 MM, I1/H Round Diamond. 12 0.008 Ct -- 1.2 MM, I1/H Round Diamond. A new sophisticated and elegant look. 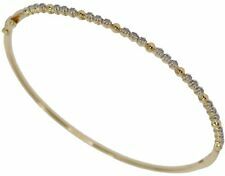 New to our Jewelry For Less collection is this Genuine Diamond & real gold bangle bracelet. Casted in warm 10k yellow gold, this stylish diamonds bracelet has genuine diamonds held between the gold mounting in pave setting. This beautiful bangle 7.5" bracelet showcases seven diamonds stationed in 14k yellow gold. Bracelet Type: Bangle. Style Bangle. Clasp Type Bangle Bracelet. 7 02.20 MM (02.11 - 02.23) Full Cut, I1 ROUND G-H GENUINE DIAMOND. This eye-catching diamond bangle bracelet is crafted in solid 14K yellow gold. This stunning style features white diamond in a braided / infinity design at the center as the focal point of this bracelet. This eye-catching and elegant diamond bangle bracelet is crafted in solid 14K yellow gold. An exceptional design, this bracelet is polished to a bright shine. Securely locking with a durable hinged clasp lock with safety latch holding the bracelet. Elegant 14Kt rose gold diamond bangle bracelet featuring a sparkling display of white round diamonds. Total weight of the diamonds is 2.00cts. Total weight of the gold is 10.03 grams. 0.016 Ct -- 1.60mm, I1/H Round Diamond. 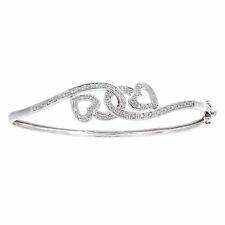 This beautiful diamond bangle bracelet is cast in10K White Gold. 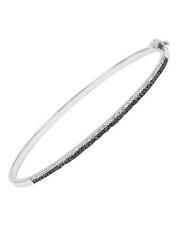 This bangle bracelet is composed of brilliant round cut diamonds in a pave setting. The total carat weight of the diamonds on the bracelet is3.0 carats. This classic bangle 6.5" bracelet showcases round diamonds flush set in 14k white gold. Quality: 14K White Gold. Stone Type: Diamond. Diamond carat weights (CT.) represent the approximate total weight (T.W.) of all diamonds in each setting and may vary no more than. 07 below the stated weight. Bangle is hinged for ease. Clear Round Faceted Full Cut Diamonds are I-1 Clarity, G-I color. 10.0 grams. 1 0.025 Ct -- 1.9mm, I1 Round Diamond. 1 0.030 Ct -- 2.0mm, I1 Round Diamond. 1 0.040 Ct -- 2.2mm, I1 Round Diamond. Style Bangle. Clasp Type Bangle Bracelet. 1 01.00mm (01.00 - 01.15) Full Cut, I1 Round G-H Genuine Diamond. 1 01.30mm (01.24 - 01.40) Full Cut, I1Round G-H Genuine Diamond. 1 01.50mm (01.41 - 01.55) Full Cut, I1Round G-H Genuine Diamond. The diamond is bezel set in solid 14k yellow gold. Bracelet Type: Bangle. 6 0.043 Ct -- 2.2 MM, I1/H Round Diamond. Bracelet Width: 1.9 mm. Bracelet Inner Circumference: 8 In. Diamond CTW: 1/4. Primary Stone Shape: Round. Kite Shaped Pave. Bezel Pave. 4 Prong Pave. Round Shape Pave. Diamond Bracelets. Ladies Diamond Bracelets and Bangles. Diamond Necklaces. These are all 100%genuinebrilliant round diamonds set an Invisible Pave Setting. This graduated bangle bracelet showcases round diamonds set in 14k rose gold. Bracelet Width: 4 mm. 2 0.010 Ct -- 1.3 MM, I1/H Round Diamond. Bracelet Inner Circumference: 7 In. 2 0.035 Ct -- 2 MM, I1/H Round Diamond. The diamond is bezel set in solid 14k rose gold. Bracelet Type: Bangle. 6 0.043 Ct -- 2.2 MM, I1/H Round Diamond. Bracelet Width: 1.9 mm. Bracelet Inner Circumference: 8 In. Diamond CTW: 1/4. Clasp Type Bangle Bracelet. Bracelet Type: Bangle. Style Bangle. Clasp Type Bangle Bracelet. Bracelet Width: 3.3 mm. Diamond Color: G-H. Diamond Clarity: I1. Diamond carat weights (CT.) represent the approximate total weight (T.W.) of all diamonds in each setting and may vary no more than. 07 below the stated weight. Style Bangle. Bracelet Trim Length: 22.4 mm. Bracelet Trim Width: 10.2 mm. Bracelet Closure Type: Box Clasp. Bracelet Width: 9.6 mm. Bracelet Inner Circumference: 7.5 In. 3 0.010 Ct -- 1.3 MM, I1/H Round Diamond. Versatile and elegant, this chic diamond bangle showcases more than 2 1/8 carats of brilliant round diamonds set in 14k yellow/white gold. 15 0.140 Ct -- 3.30mm, I1 G-I Color Round Diamond. Clasp Type Bangle Bracelet.